DHL has today (September, 10) announced a multiyear global partnership with the FIA Formula E Championship, the world’s first fully-electric car racing series beginning in September 2014. The announcement was made in conjunction with the unveiling ceremony of the official Spark-Renault SRT_01E Formula E car at the International Motor Show in Frankfurt (IAA) on September 10, 2013. 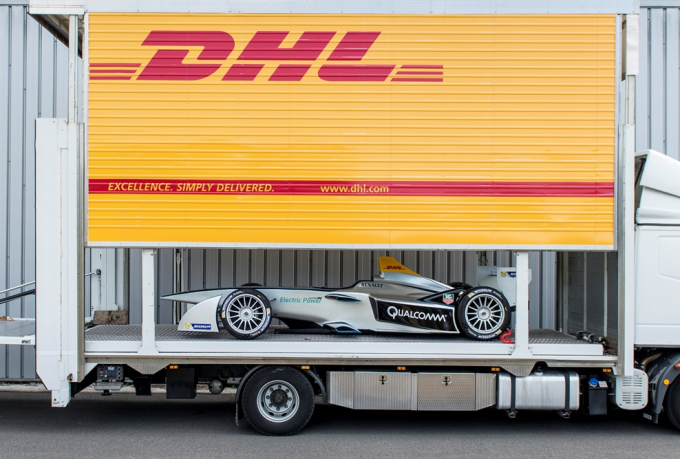 As the logistics supplier and a Founding Partner of Formula E, DHL was responsible for the transportation of the car from Paris to Frankfurt. As the first official activity in support of Formula E, DHL Global Forwarding Freight transported two of the Spark-Renault SRT_01E single-seaters from Paris-based Spark Racing Technology, who have designed and built the new zero emission racers, to the revealing ceremony at IAA in Frankfurt. All emissions created by this transportation will be offset via investments in DHL’s GoGreen portfolio of certified international climate protection projects. In the context of the Championship series, DHL will provide the FIA Formula E Championship with an extensive range of logistics services, incorporating the most efficient and green technology and processes available today. For ten race locations worldwide, DHL will ensure that all racing cars, spare parts and lithium-ion batteries are delivered safely and on time. DHL is a leading provider of sustainable logistics solutions. In numerous industry sectors, the company is in the driving seat, especially when it comes to the reduction of carbon emissions and implementing new technologies. Therefore, e-mobility and carbon-free vehicle concepts are key elements for achieving Deutsche Post DHL’s target of improving the CO2 efficiency of its own operations and those of its transport contractors by 30 per cent between now and 2020.